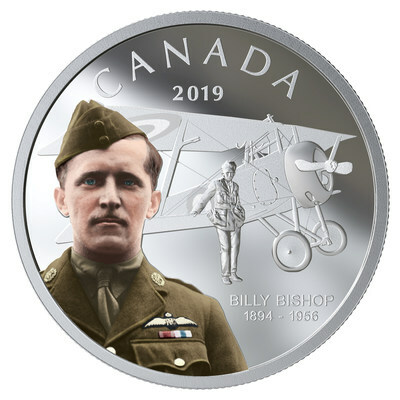 OTTAWA, Ontario, Feb. 8, 2019 /PRNewswire/ — This month, the Royal Canadian Mint tells a story of valour in combat with a tribute to Canadian First World War flying ace Billy Bishop. This fine silver coin continues the Mint’s proud tradition of preserving the memory of the heroic men and women behind Canada’s military history. Squadron Commander Bishop is remembered in an engraved, colour portrait of the famed pilot and his aircraft, a Nieuport 17 he affectionately named “Little Daisy”. This coin, along with many new and exciting keepsakes, is now available for purchase. The Mint opens another chapter in history with the first of a series of 2019 coins celebrating the 100th anniversary of CN Rail: a $200 pure gold coin designed by artist Tony Bianco. Its reverse features three locomotives symbolizing distinct periods in the railway’s first 100 years. A circular ring of track frames a design featuring a map of Canada, which CN spanned from coast to coast, playing a vital role in our country’s development. Little-known pieces of Canada’s numismatic past are also brought back to life in the 2019 Fine Silver 2-Coin Set – Royal Canadian Mint Lore: Back to Concept. Consisting of an impressive pair of 2 oz. silver coins, this set captures the original artwork proposed by artist Emanuel Hahn for the launch of Canada’s Voyageur silver dollar and the Caribou 25-cent circulation coin over 80 years ago. It may surprise some to discover that our 25-cent coin could have included an engraving of the Big Dipper constellation, floating above the image of our well-known caribou. 1-800-268-6468 in the US, or on the Mint’s web site. The coins are also available at the Royal Canadian Mint’s boutiques in Ottawa and Winnipeg, as well as through our global network of dealers and distributors, including participating Canada Post outlets.